The ney (reed flute) is one of the oldest and most revered musical instruments of the near and middle East. It is particularly respected within the Sufi tradition of religious services for the Mevlevi Dervishes founded by Jelaladdin Rumi in the thirteenth century. Kudsi Erguner grew up within the Mevlevi tradition in Turkey and is the fifth generation within his family to become a ney player. He is globally recognised as a master musician and has been at the forefront of maintaining an authentic line of traditional Sufi music which has barely survived repression in Turkey since Kemal Attaturk came to power in 1924. This was a rare opportunity to listen at first hand to Mr Erguner speak about his heritage and play traditional maqams (using different modes) and taksims (improvisations which are used as an introduction to the zikr ceremony) from the Mevlevi tradition. The event was greatly assisted by the intimate space at 9 Clarendon Cross which allowed performer and audience to be close together. I was not expecting to be so touched by the humility, warmth, and humour of his manner and words as he explained some of the subtleties of the ney, including the demonstration of seven different types of third intervals, the use of a musical scale with 41 intervals and a description of one of the rhythmic cycles of 10 used in some of the pieces. The first piece was introduced with the words, “let me speak to you in my language”. 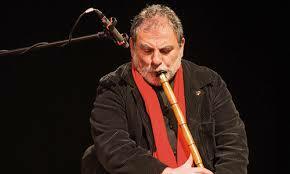 According to Mevlevi tradition, the sound of the ney is synonymous with separation. Just as the reed used for the ney is separated from the reed bed, the Mevlevi believe that mankind is separated from God and longs to return. The sound of certain improvisations and melodies played on the ney can be a deep reminder of this separation and provides a call to return to something deeper in oneself. In trying to listen to the gentle fluctuations of the melody using these finer intervals that my ears are not accustomed to, it was noticeable that a certain inner tuning was taking place between the player and the audience which pulled me away from daydreams or thinking about the past or the future. This effect was made more poignant because of the realisation that the full, authentic zikr ceremony is hardly ever performed. The music ended just as my listening was becoming accustomed to the sounds. One was left with an impression of a man in service to his musical tradition and who is in search, open to life. Journeys of a Sufi Musician by Kudsi Erguner, translated from the French by Annette Courtenay-Meyers. This is a deeply moving account of Mr Erguner’s life, starting with his childhood in Istanbul and recounting his struggles to maintain some traces of the living Sufi musical tradition whilst balancing this demand with the need to earn a living as a professional musician. Most telling are the recollections of how he learned the ney with his father, the warm and lively gatherings of the dervishes in the face of government repression, the glimpses of a supportive neighbourhood based on mutual respect in which he grew up, and a beautifully clear description of the zikr ceremony. It is not easy to read because of the sense of a rich heritage that has been lost. The book is accompanied by a cd of music from Mr Erguner’s archive which includes early recordings of his father and grandfather playing the ney, and some evocative singing. The pieces demand to be listened to with attention.